The winter that I was three and a half years old, my Dad came home with two little pairs of homemade skis for me and my younger brother, who was two and a half. They were made of wood, with bear trap bindings, metal toe plates with a leather strap, green lino heel plates (the linoleum from our kitchen floor), and cables that cinched across the back of the heels. They had no metal edges nor bases. Dad waxed the wood on the bottom side to make them slide. One pair was painted red and the other pair was green. We didn't have ski boots, but wore our winter boots in the skis. At that time our winter boots were mid-calf height pile lined rubber overshoes that we pulled on over our leather shoes. Dad started teaching us to ski. First he taught us to walk up the driveway and glide down. The driveway had a very slight incline. Then he tramped down the side hill by our house, which had a slightly steeper incline, and began teaching us to snowplow down the hill and sidestep back up. The next winter, we began taking Saturday morning ski lessons given by the Ski Club at Warren's Hill, a farmer's field just outside of town. There was no lift at Warren's Hill. We skied down and sidestepped or herringboned back up. As a founding member of the Ski Club, my Dad was one of the ski instructors. By the time I was six, I had a little pair of red rubber lace up ski boots (hand-me-downs from another skiing family) and my own poles with leather straps and baskets. That winter, another member of the Ski Club installed a rope tow on a hill on his farm. The annual Ski Club races were held there. I, of course, competed in the slalom and giant slalom, as did my best friend at school. We both won ribbons. I had never skied at that hill before. It was much longer and steeper than Warren's Hill. I loved going fast down the big hill. The rope tow also was an exciting novelty, and I quickly caught the hang of it. Suddenly, I heard my Dad shouting my name. "Fall down!" he yelled. "Fall down!" Why was he telling me to fall down? I saw people turning to look at me as I skied past them. I was a confident skier. I had no intention of falling down in front of everyone. That would be so embarrassing. As I came to the bottom of the hill, the snow became very rough and I managed to stop. Or maybe I did fall down; I no longer remember. My Dad caught up to me then, and he was angry and upset. He explained that there was a creek that went along the base of the hill, and he was afraid that I was out of control unable to stop, and that I might have ended up in the creek. I hadn't known about the creek, and I could vividly imagine falling into the freezing water. I remember that ski day with mixed emotions: the excitement of skiing on a bigger hill with a lift, the pride in winning the slalom race, the shame of everyone staring at me expecting me to fall down, the disappointment that my Dad did not see me as a fully competent skier, and the recognition of his love and desire to protect me from harm. My Dad has been gone for nearly eleven years now. I still miss him very much, especially on days like today that I spend at the ski hill. I have started a new painting. It is a winter snow scene set in an urban park. I am working from a reference photo that I took about a year ago of the location. At this time of the year, late December, the days in Canada are very short. The light fades by four o'clock. I took the photo on an overcast day in the afternoon just as the light was waning. What struck me about this scene was the dramatic composition. The arched wooden bridge on the left crosses from an island in the foreground to a land causeway (not visible) to the far side of the small lake. The bridge and a tree are reflected in a bit of open water, whereas the rest of the lake is covered in snow. 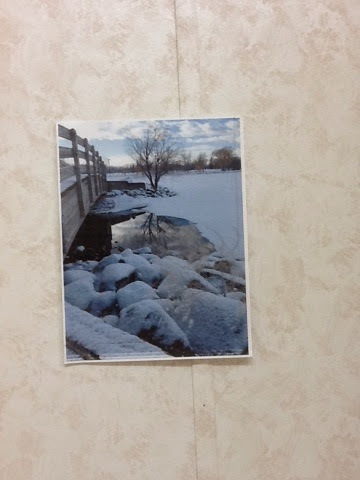 I like the way the snow-covered boulders and the bridge lead the eye toward the reflections, the tree, and the horizon. I began by drawing the main shapes with graphite. 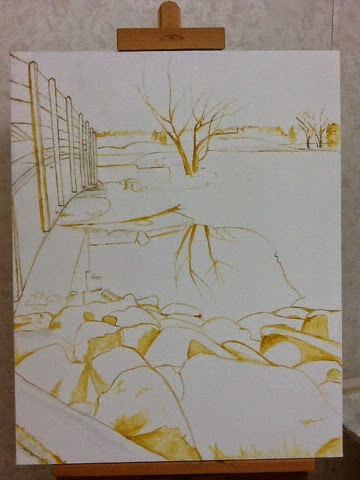 Today, I finished sketching in the lines of the main shapes over the pencil lines with thinned yellow ochre paint. I don't often draw the lines in with paint, but I wanted to for this one because it is a very structural painting. The arched bridge was challenging to draw, and I did not want to lose the drawing once I started to block in the colours. As well, the stark tree and its reflection, and the jumble of boulders add complexity that I would not have felt comfortable blocking in as masses without doing the drawing first. Redrawing the lines with paint over graphite also gave me a chance to correct some drawing errors. As you can see, I have indicated some of the areas of darker values -- the trees and the shadows of the boulders. In drawing the boulders, I found it helpful to give them some three dimensional form. However, I haven't indicated the areas of darkest values, which are the bridge reflection, the wooden bridge foundation and buttress, and the far treeline. This painting will be challenging for me in several ways. It is the largest painting I have attempted, 20 by 30 inches. I have been trying to start working larger, but the next largest one I have done in recent years is 18 by 24 inches. I am hoping that by working larger with larger brushes, I will be less tempted to pick away at tiny details and end up overworking the painting. Another way in which this painting will be challenging is because of the colours in it. I usually tend to create very colourful paintings, often dominated by light values. This one will force me to work more with a grey range (blue greys and purple greys), and I know I will find it hard to make the snow values dark enough. However, the snow has to be rendered in a mid value range so that the little bit of bright sky and reflected sky will really shine. A final challenge will be the large areas of more or less solid colour, like the snow field in the middle right, and the large snow covered rock in the bottom right. I tend to create very busy images, and often avoid painting larger "blank" areas. Yet they are so important to frame the focus of interest. So you can see that I have set myself quite a task with this snow scene. I presently have a dilemma with how to proceed with the blocking in. Initially, I was planning to do a value underpainting in a contrasting colour. In particular, I was thinking of magenta. However, I spent a long time contemplating the photo, and went for an afternoon walk to the same location today to look at the actual scene again. Although some snow scenes have a pink undertone (and I have used pink or red violet or magenta effectively in snow scenes before), I just don't see a pink undertone in this one. So then I contemplated cadmium orange or cadmium red medium or Indian red or burnt sienna as possible colours for the underpainting. Or another possibility would be to block in the main colour areas and values with the local colours that I see in each major shape. I am reluctant to do this though, because that would mean putting white in the mix right in the first layer in order to make the greys. I would prefer to block it in with transparent colour and only in subsequent layers begin to add white, because pigments mixed with white become opaque, which I find can lead to a chalky or muddy look. Hmmm. What to do? Maybe I should do a couple of small studies with various contrasting choices of underpainting. I am usually so eager to get on with the actual painting that I skip this step. Or I could finish blocking in the values with the yellow ochre, and then lay Indian red or burnt Umber over top of the darkest darks. Or maybe I could use one of my blues to create a unifying underpainting. Hmmm.